Good morning and happy Monday. It’s Beatrice and I’m back on the blog again hoping to inspire you with layouts using “Strawberry Lemonade”. I’ve discovered so many more gorgeous layouts using this collection; I’d like to feature them here. First up is Strawberry Blonde by Jenni. 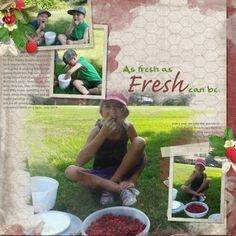 She used a template by Christaly in creating this adorable layout featuring two strawberry blondes in her family. I love the clever play on words. The pops of yellow and orange she added to the almost monochromatic look, direct the focus to the photo. The curly ribbons and the bit of burlap added behind, support her layout design and the vellum topped date tag, allowing the strawberries to peek through, is a great touch. Kythe is a master at blending papers and she used this technique to perfection in Lemon Goodness. I really like the way most of the layout is concentrated in the corner and the stitched framing is quite clever. 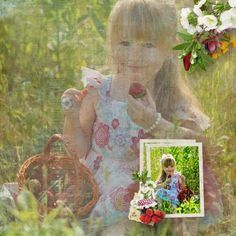 It’s the blending that really makes this a standout; the plaid in the center as well as the barely visible strawberries throughout, add just the right amount of color to her subtle background paper. The large, muted photo in Possibilities by 6grand is perfect for this collection. She used a template by Heartstrings Scrap Art. Her clusters are so pretty and her shadowing is lovely. I really like the way she incorporated the kit elements and word art into her photo. The pitcher of lemonade and bowl of strawberries are seamlessly worked into the photo and the painted flowers and word art add color in just the right way. Another photo perfectly matched to the collection is featured in Lemons by Joanna. She also used a template by Christaly. I love the painted background paper which is actually a part of the kit. Only the spatters are added. The clustering down the side and behind helps to frame the photo and the word art tag works perfectly as her title. I’m always drawn to a layout using the combination of a large, blended photo along with smaller photos. Life is Sweet by dj_w also uses a template by Heartstrings Scrap Art. I love the texture in the background paper and the way she incorporated multiple word strips. The sprinkling of tiny embellishments reinforces the horizontal design. I love the way she clipped the paper to the word art and added the bubbles and paint to the background. 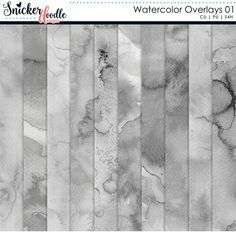 If you would like to try out a sampling of this collection, please check out the Use It All Challenge at TDC which includes this free mini by Snickerdoodle Designs. I completed this layout using just the mini and a free alpha from Kimeric Kreations. I really like how so many papers in the collection are already blended and provide an artsy look to a layout without any work on the part of the layout artist. I hope you have found these layouts inspiring. Enjoy the rest of the week and take time to create something for yourself.